The good news is traffic to healthcare.gov on open enrollment deadline day was heavy. The bad news is it caused the site to malfunction, rendering prospective users unable to create new accounts. The AP reported around 1:50 pm EST that a spokesman said technicians identified the issue and later resolved it as more than 100,000 people had been trying to access the system at one time. 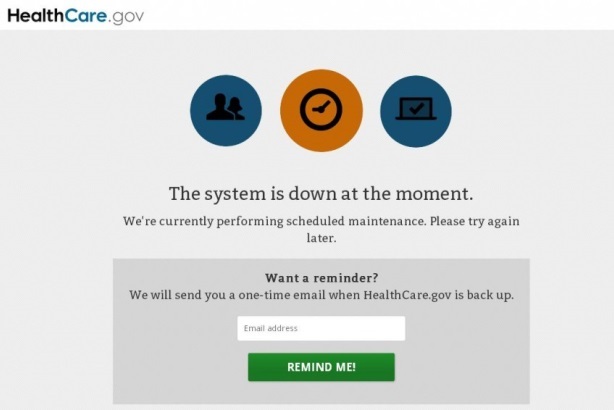 InTheCapital, a DC-based blog, reported around 10 am EST that healthcare.gov was down for close to six hours – between 3:30 and 9 am – for maintenance. Apparently, site maintenance at the crack of dawn is pretty routine, albeit a surprise on the final day of sign-ups, and according to the blog, users could leave their email addresses to hear back when the site was up and running again. Working or not, the White House retains its lead foot when it comes to driving healthcare.gov visits on the last day of regular open enrollment. Celebrities including Oscar-winner Jared Leto and Grammy-winner John Legend tweeted to their legions of followers, reminding them today is the last day to get covered. US Secretary of Health and Human Services Kathleen Sebelius appeared on HuffPost Live Monday to rebuff a claim made on Fox News Sunday by Sen. John Barrasso (R – Wyo.) that the White House is "cooking the books" as it pertains to Affordable Healthcare enrollment. Sebelius noted the surge in visits to healthcare.gov after President Barack Obama appeared on the Funny or Die web series Between Two Ferns. President Barack Obama shared the news via conference call on Thursday that enrollment had topped six million, the administration’s goal after readjusting it from seven million. It marked it a win, even if it was symbolic. Perhaps to be expected, Saturday Night Live got in the game just ahead of the deadline, going all in during Saturday’s cold open, as they depicted POTUS (played by Jay Pharoah) begrudgingly agreeing to various celebrity-filled photo ops in an effort to generate 10 million ACA signups, including kissing Justin Bieber (Kate McKinnon in a cut-off vest) on the lips. Even Bat Kid made an appearance. Final numbers will be recorded and likely touted. It’s the campaign, though, that the American people will surely never forget. Editor's blog: How will "the Mikes" spend their money?